These triangles are from one block wonder book, don't know author. I have made all these triangles and know I have forgotten how to join them together. I do have the book but my friend is in New York visiting her daughter and family. Can anyone help. I remember it was rows of these shapes then mind a blank. OBW blocks consist of 6 triangular pieces. The high point of the triangle come to the center. The 2 bias edges are inside the hex and the straight of grain edge is on the outside. 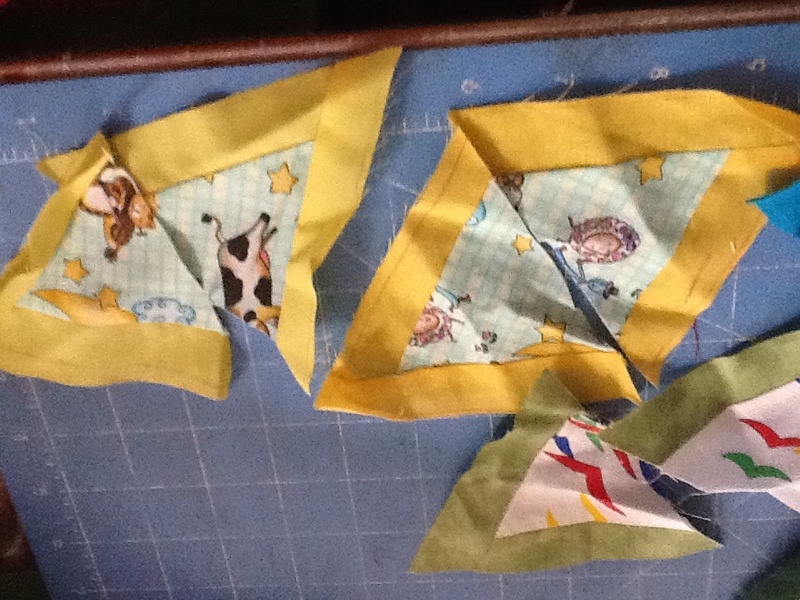 Sew three triangles together to make one half unit. Sew the other 3 together to make another half unit. Pin these two units together. Make all blocks. Hopefully someone else will jump in because I really cant put into words how to arrange the blocks. But they are arranged to sew together in rows. I think if you look on youtube and type in OBW or One Block Wonder you will come up with some tutorials. OBW triangles are cut by lining up 6 layers of the same fabric so that the same design element is at the same place on all 6 layers. 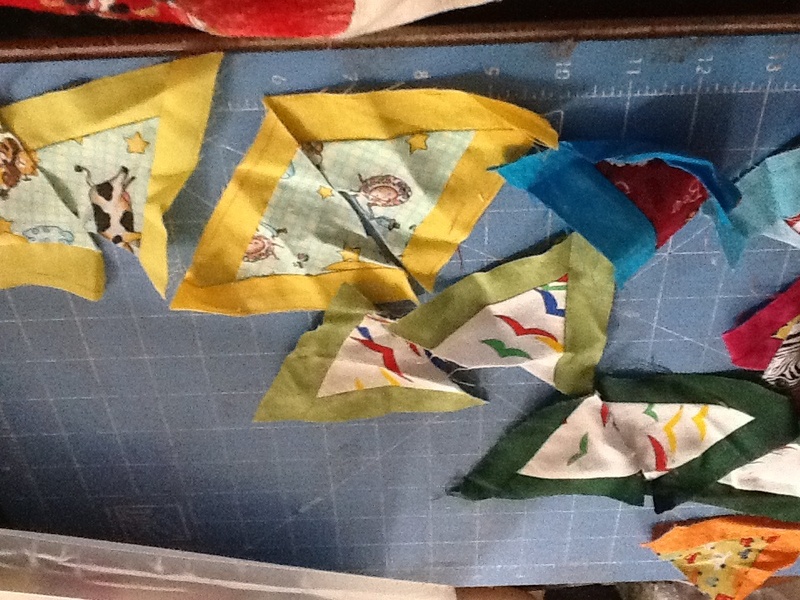 Strips are cut from the layers, and then equilateral triangles are cut from the strips. 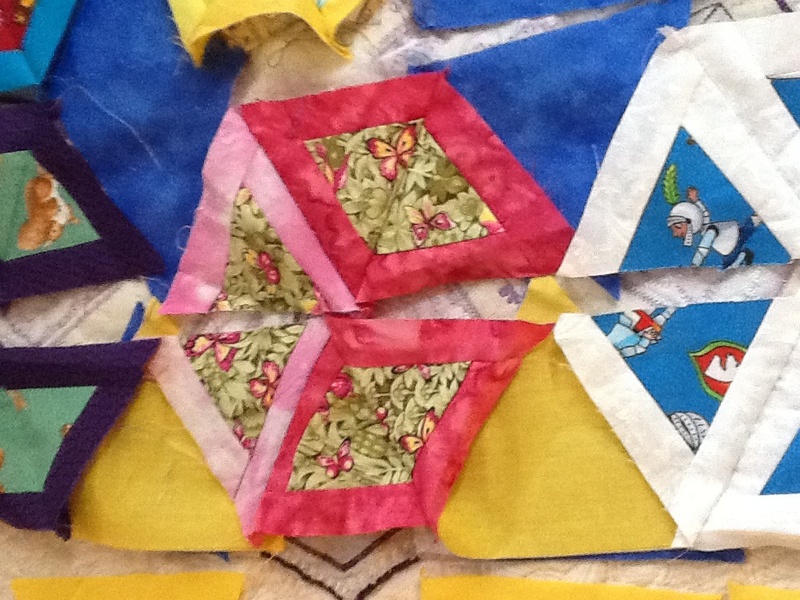 Then the 6 identical pieces from one triangle (all 6 layers) are put together to form a kaleidoscopic design. Your pieces do not look like they are for a OBW. They might, however, be for a hollow cube, which is included in some OBWs. The author of the books for OBW is Maxine Rosenthal. OBW is when repeats of the same unit are put together to form a new pattern similar to a kalaiscope pattern. 6 triangles are put together to form hexagons without any other fabric sewn to them. I don't think you can put yours together into a pattern due to additional fabric added to the edges. 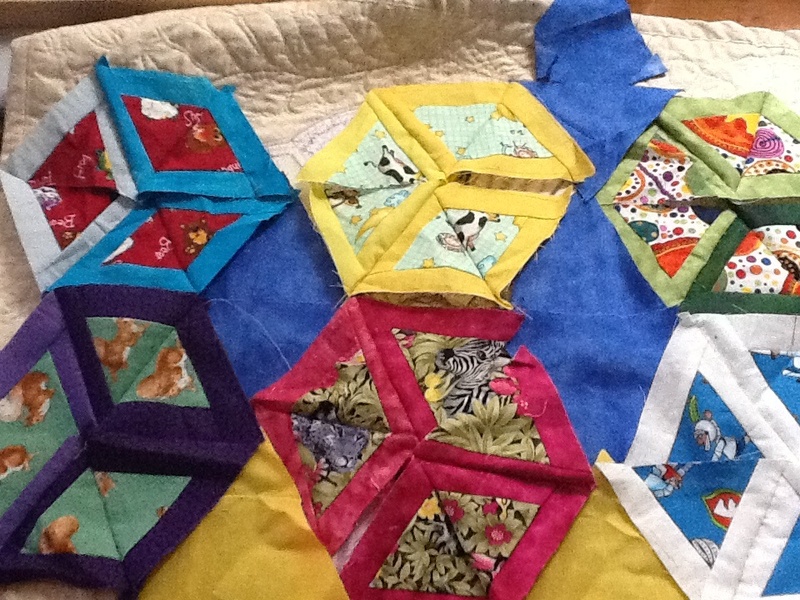 The hexagons halves are then sewn together in rows and the rows are sewn together. Cutebuns did a tutorial for QB you might get some pointers from it. That is such an interesting block! I've never seen that before. I do hope you get them together. they should look great. keep going!! Thank you everyone going to spend today trying to fit them together . Hope I have 6 of each. Quilters thank you for your help. Here are the 6's I found the rest have either 4 or 5 and I plan to do those tomorrow. Today I made these and began playing with layout. I really like what you have one! This is not at all what I thought a One Block Wonder was!! I guess there is more than one. It will be a great quilt. Crashnquilt, is there any way to chain piece these units? They are joined in rows down the centre of each block and connecting triangle between each half section? This looks interesting. Looking forward to seeing the completed project. This was so unexpected for me also but it is going to look fantastic!!! Very interesting blocks and thanks to racerh for sharing the link to the instructions. For one block wonder blocks, they need to come together so that they look like mini kaleidoscopes. Therefore, I think you should remove the borders that you have around the triangles and sew each long edge to its matching one so that you form a hexagon - type shape. Then, if the design doesn't appeal to you, put a border around each hexagon and it will look like stack and whack. Jitkaa they are supposed to have the blue yellow triangles on I remember them in the pattern I was using.